Angela Sommerhoff (born 1970 as Angela Wilde in Pforzheim, Baden-Württemberg) is a German contemporary artist. After finishing high school in 1990, she studied painting and sculpting from 1991-1995 in Vienna. She continued to study history of art at the University of Vienna (1995-1997). Currently, she lives and works in the countryside south of Munich (Germany) with her family, where her studio has been located since 2013. Angela initially started playing the violin as a six-year-old girl, before pursuing visual arts as a painter later on. At the age of ten, she joined a string quartet which performed so exceptionally well they were invited to compete in several musical competitions called “Jugend musiziert”. After finishing high school in 1990, Angela Sommerhoff toured Germany with several youth orchestras. In 1991, Angela began her art studies in Vienna, Austria at a private institution. Her work included both painting and sculpting. One of the main subjects of her studies at this time was metamorphosis, as well as the phenomenon of human color perception described in the theory of colors by Johann Wolfgang von Goethe, which also influenced Philipp Otto Runge, J. M. W. Turner and Wassily Kandinsky. Angela continued her education with two years of art history at the University of Vienna. She married Christian Sommerhoff in 1997 in Vienna and gave birth to two daughters (Amanda Rebecca, 1997 and Daria Viola, 1999). Since her time in Austria, Angela Sommerhoff has worked as a freelance artist and displayed her art in numerous exhibitions in Europe. In 2007 the family moved to Bedford (NH), before relocating to Germany. Since 2013, Angela Sommerhoff has worked in her studio in Bad Tölz, located in the Alpine foreland, south of Munich. Typically, she starts her work by playing Bach violin sonatas, as music has always been a major source of inspiration. Artists that have influenced her are Emil Nolde, Marc Chagall, Alexej von Jawlensky, and Mark Rothko, among others. Angela Sommerhoff strives to capture the beauty of a thought, an experience, or encounter she had. It is positivity and esthetics she endeavors, in a constructive and inspiring, non-placatory manner. Apart from her artwork for exhibitions she is in great demand for remittance work. The current work by Angela Sommerhoff can be categorized between chance and necessity. Her recent, mostly quadratic paintings shimmer in pastel tones. The colors change, flowing in fine layers over the surfaces, making room for the white. Many ink flourishes are incorporeal, some lines cross. Selected paintings show traces of a chemical process, and sometimes the artist paints using impasto or layered structures. She sets corporeal material (quartz sand, Japanese rice paper) against the lightness of the lucid ink that lies like colored veils over the light base. Seemingly incorporeal but differently tempered colors without characteristic style in contrast to impasto or structured elements allow the former to appear as colored light. However, according to the artist, the white offers a kind of space, a resonating body, in which the vibrations [ripples] of the colors can spread out. The white commonly stands for flawlessness, perfection and beauty. Beauty can also refer to the pure colors in Sommerhoff’s paintings. In this emergence, chance often leads the way by organizing the fluidity of the ink in a complex manner, while the eye of the artist responds to what emerges, and recognizes compositional necessities. The question, to which many of Sommerhoff’s projects relate, is that of existence in time. The presence of persons, of plants – thus collectively: the natural – in the room was demonstrably important for Angela Sommerhoff up to about 2010/11. In her early works, the Vienna-trained artist mainly used flowers, blooms and landscapes with fragile human or animal figures as the starting points for her research on illusionism, and to convey the impossibility of setting life itself onto canvas. Her figures were always shadowy and strangely undefined. The dissolution of the contours contributes to this effect, which led to a gradual softening of the forms and a trend toward masses of color. As Sommerhoff defines her art as a part of her realm of experience, the landscapes and insights she has been absorbed with in recent years can be recognized in her work – whether it be harmonies and discords arising from harmonics, the skylines of American cities, the blaze of colors of Africa or the cabbalistic concept of Tikun Olam to save the world. 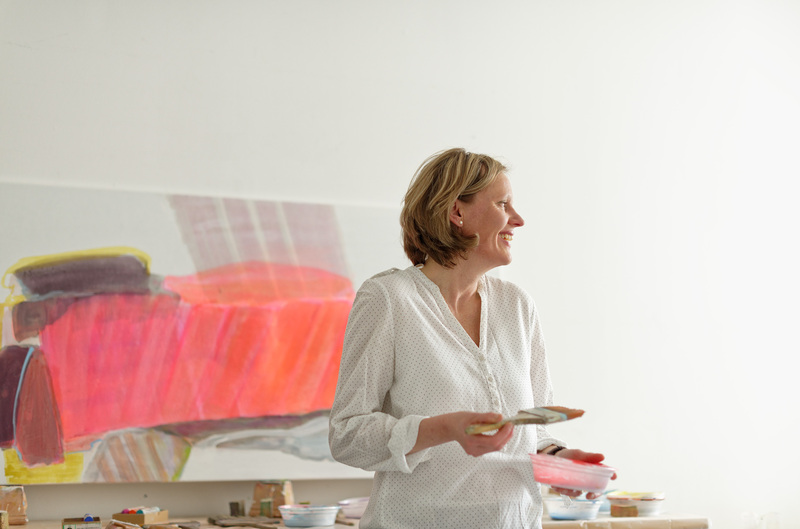 The belief that everything is interconnected has allowed Sommerhoff, since the start of the 2010s, to increasingly follow her sense of color and form. Of equal importance to the dialogue of the painter with her paint media and her handling of color tones is the close connection between order and disorder, evident in Sommerhoff’s painting. In previous years, the artist often worked with symmetries, commonly called mirrored counterparts, while in her most recent works, balance is constructed despite asymmetry. Color with all its qualities increasingly takes center stage in Angela Sommerhoff’s artistic thinking. It has become an essential point in her painting. Nevertheless, for her, it is not only about experiments with color effects and surface divisions, detected mainly in the balanced suspense between color masses and the structuring white, but rather about an openness to the intangible and the indescribable, which is reflected in Sommerhoff’s compositions. When asked about the starting points of her painting, Angela Sommerhoff responds by referring to Nelly Sachs: “It all starts with longing”. Longing is the emotion that August Wilhelm Schlegel described as swaying between memory and premonition. It is a state that can just as well result in dreamy moments as it can be the starting point of activity. It is this longing, evoked by Sommerhoff’s interest in “Metamorphoses”, the “processual nature of life” and repeated poems, conversations and music, which inspires the painting. Thus, the artist positions herself between a naive desire to paint and refined calculation. On the one hand, the works inspired by encounters with people, music and poetry arise almost spontaneously on the canvasses, while on the other hand, the artist methodically explores selected topics through cycles. “How can you capture more of the quality” is one of the central questions posed by Sommerhoff in her works. She has recently set the complexity of the world and the fast pace of time against abstract paintings. She puts herself – with the help of Bach, Mozart and Beethoven – and the viewer of her works in a state that wants to distance itself from the everyday. In her works, she transmits impressions from the soundscape. To feel oneself and reflect on one’s own perceptions could be designated as the objective of her art. It may be obvious that only an initial impression is not enough. The encounter with Angela Sommerhoff’s art requires patience and serenity, and a viewer that lends the image her story. Mag. Alexandra Matzner, B.A. studied art history, history and Romance studies in Vienna and Rome. Curator and editor-in-chief of ARTinWORDS.de. Alexandra Matzner curated the exhibition Arik Brauer – Gesamt.Kunst.Werk for the Leopold Museum (2014) as well as the exhibition “Möbel in allen Lebenslagen” for the Liechtenstein Museum (2007). Author of numerous publications and catalogue essays on photography and visual arts of the 19th to the 21st century. Lives and works as a freelance writer in Vienna. Editorship and publications: “raum_körper einsatz. Positionen der Skulptur” (MUSA 2010); Space Affairs (MUSA 2012); Farbholzschnitt in Wien (Leopold Museum 2012); “Frauen ohne Eigenschaften? Zu Xenia Hausners Rollenspielen und der unerschöpflichen Rätselhaftigkeit ihrer Bildfindungen” (Essl Museum 2012); “Vanity. Fashion Photography from the F.C. Gundlach Collection” (National Museum Kraków 2013); Arik Brauer (2014); collection catalogue for the Treasury of the Teutonic Order in Vienna (2015); “Mit Onkel Gustav auf Sommerfrische. Das Mal- und Lesebuch über Gustav Klimt für Kinder” (together with Stefan Kutzenberger, 2016); “Fürstenglanz. Die Macht der Pracht” (Belvedere 2016); “Weit weg im Westen war die Landlinie tiefblau. Zu Max Kurzweils Druckgrafiken”, in: Agnes Husslein-Arco, Markus Fellinger (eds. ), Max Kurzweil. Licht und Schatten (exh. cat. Belvedere 2016), Vienna 2016, pp. 51–61. ; “Haben Sie Wiener Kunst im Hause?” in: Max Hollein, Klaus Albrecht Schröder, Tobias Natter (eds. ), Kunst für Alle (exh. cat. Schirn, Frankfurt; Albertina 2016/17). August Wilhelm Schlegel, Lectures on Dramatic Art and Literature, in: Edgar Lohner (ed. ), Critical writings and letters V., Stuttgart 1966, p 25.